It speaks volumes for the talent, spirit and belief at both clubs that they remain firmly in premiership contention despite suffering injuries that would have torn the heart out of most teams. This clash for second position features two combatants who are almost identical in win/loss record (11-4) as well as points scored and points conceded, but the overwhelming factor appears to be the venue – Collingwood’s home ground, the MCG – where the Eagles haven't defeated the Magpies in more than 23 years; where the Eagles have played just once this season, narrowly beating lowly Carlton back in round five; and where the Pies have been undefeated in their past four starts, including blockbusters against Melbourne and Essendon. Despite their well-documented personnel issues, Nathan Buckley’s men are hot favourites after winning seven on the trot – a current competition-high. 1. West Coast hasn't beaten Collingwood at the MCG since round two, 1995, losing each of their subsequent 10 clashes there. The Eagles won their only other MCG game this season, albeit against bottom side Carlton. 2. When the sides last met, Collingwood trailed by 18 points at three-quarter time before powering home with five goals to one in the final term. Jordan De Goey was best-afield with 20 possessions and four goals. 3. Collingwood is ranked No.1 in the AFL for disposals, averaging 411.2, while West Coast is 16th with 352.5. 4. Both teams have been entertaining to watch this season with the Magpies the third-highest scoring team with 93 a game and the Eagles fourth with 91. 5. With Collingwood and West Coast to clash for the 50th time, they are 24 wins apiece (and one draw). The Pies have won their past two encounters. 6. Collingwood midfielder Tom Phillips continues to rise in the Schick AFL Player Ratings, lifting to a career-high ranking of No.89. At the end of last season was he No.322. 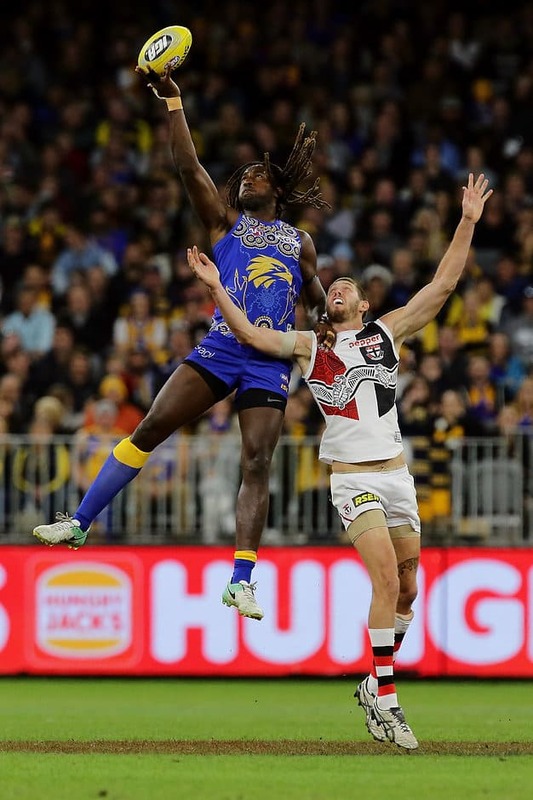 Nic Naitanui. When it comes to ruckmen, much of the talk this season has centred around Collingwood’s Brodie Grundy and Melbourne’s Max Gawn, so ‘Nic Nat’ has a golden opportunity to remind the folk in the east just what a powerful presence he is when he and Scott Lycett take on Grundy and Mason Cox. Naitanui might well win the ruck duel but he’ll need to limit Grundy’s non-stop, all-round game.